GUEST POST: Beginner's Guide to Bureau of Health Workforce Scholarship and Loan Repayment Programs — Future Proof M.D. Here is some basic information on each of the programs. If you are eligible and interested in applying, make note of deadlines, and consider signing up to receive email notification of application openings (where applicable). Note: This report provides an overview of the programs. Make sure to closely review program requirements before applying. Eligibility: You can apply if you are a medical (MD and DO) or dental (DDS or DMC) student in your final year of school. You must be a U.S. citizen or U.S. national. 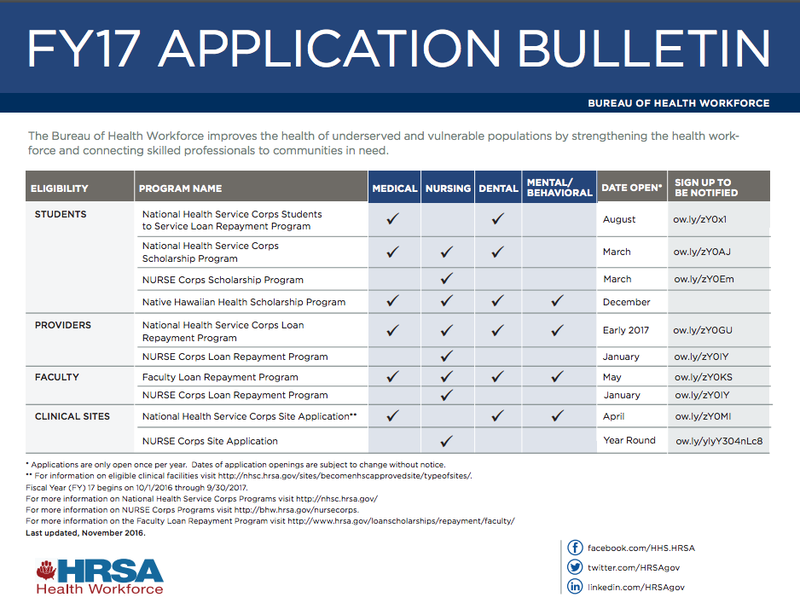 Application deadline: The next NHSC Students to Service application is scheduled to open in fall 2017. To be notified when it opens, sign up here. More information: Visit the NHSC Students to Service Program website here. Eligibility: You can apply if you are committed to primary care and accepted to or enrolled as a full-time student at an accredited U.S. school in one of the following primary care disciplines: physicians (MD or DO); dentists; nurse practitioners (post-graduate degree with clinical practice focus); certified nurse-midwives; and physician assistants. You must be a U.S. citizen or U.S. national. Funding available: Scholarship pays tuition, fees, other educational costs, and provides a living stipend (payments other than the living stipend are federal income tax-free). In exchange, students commit to work at least two years at an NHSC-approved site (see above for examples) in a medically underserved community. Service begins upon graduation (and completion of primary care residency training for doctors and dentists). When in service, scholars earn a market-rate salary, paid by the employing facility. Application deadline: The next Scholarship Program application is scheduled to open in spring 2017. To be notified when it opens, sign up here. More information: Visit the NHSC Scholarships Program website here. Eligibility: You can apply if you are enrolled — or accepted for enrollment — in a professional nursing degree program at an accredited school of nursing in the United States. You must be a U.S. citizen (born or naturalized;, a national or a lawful permanent resident; free from any federal judgment liens; free from an existing service commitment; and are not overdue on a federal debt. Funding available: You can receive tuition, eligible fees, annual payment for other reasonable costs (e.g., books, clinical supplies/instruments and uniforms), and a monthly stipend. The full award is taxable. In exchange, you must work at a facility with a critical shortage of nurses — a critical shortage facility (CSF) — upon graduation. More information: Visit the NURSE Corps Scholarship Program website here. Eligibility: You can apply if you are of native Hawaiian ancestry and are enrolled as a full-time student in a fully accredited health professions program located in a U.S. state, the District of Columbia, the Commonwealth of Puerto Rico, the Commonwealth of the Northern Marianas, the U.S. Virgin Islands, the Territory of Guam, the Territory of American Samoa, the Republic of Palau, the Republic of the Marshall Islands or the Federated States of Micronesia. You must be enrolled in an NHHSP eligible health profession, which includes physician (MD or DO), nursing, dental and mental/behavioral. Funding available: You can receive funds to support school tuition and fees, an annual payment for other reasonable costs (e.g., books, clinical supplies and instruments), and a monthly stipend to cover living expenses. All benefits are subject to federal taxes. In exchange, scholarship recipients are required to serve full-time in medically un- or under-served areas in Hawaii for 2-4 years, depending upon the length of time of scholarship support. Application deadline: The next application submission deadline is March 1, 2017. More information: Visit the NHHSP website here. For the 2017 application and program guidance, click here. Guest author Chris Saviano is responsible for Business Development and Sales at PGM Billing and leads PGM's product integration between proprietary cloud-based practice management software and integrated back office service operations.